Growing up in the Stickney neighborhood near Midway Airport, Joan Dolinar and her husband lived and worked many years in Chicago before their children began leaving home. Then they looked for a place closer to the kids and decided the western suburbs of Chicago looked good. That was twenty-five years ago - those years spent figuring out the highways and byways of a small town as she commuted to work in the city until she retired in 1998 from Inland Steel. Because she was always too tall for clothes off-the-rack, Joan began making her own garments at an early age, and slid easily into making Barbie Doll clothes. Before long she was making christening and communion gowns and wedding attire for family and friends. When a new quilt shop opened near her (Pieceful Heart) about the time she retired, she was eager to take beginner classes. Her friend and neighbor, Rita Farrell, also a quilter, urged her to join the guild, which she did in 2000. Joan has served on the board in the past as co-chair of membership and also co-chair of hospitality with member Linda Snapp. She laughs as she complains that she’s too busy to be in a bee. This is not hard to believe when she displays photos of the many quilts she’s made. Her applique work sparkles in a hexagon and floral quilt. She pours her heart right into her work, as one can see in "My Father’s Roses," a loving tribute to her deceased father’s love of growing them. The same is true of the "Stanley Cup" quilt she created for her husband from souvenir ice hockey towels. 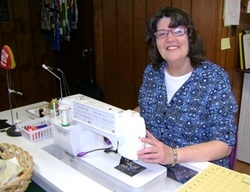 Although she’s beginning to get a little more comfortable with machine quilting, she is happy just piecing and takes her quilts to a professional quilter to get the look she wants. A search of topics on www.google.com is her default way to find quilt info on the Internet. As for styles and techniques, she is willing to give most things a try and is currently working on raw silk with wool designs overlaid, from a recent RQG workshop with Lynn Schmitt (www.adifferentboxofcrayons.com).